Rearing and management of honey bees for commercial production of honey and other products of the beehive. 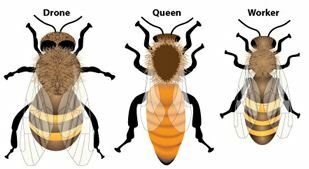 C) Worker bee: Sterile female bees not capable for reproduction. - It is good food with vitamins, sugars. - For desensitizing people allergic to bee stings. - It is also used in candle making. - It has wound healing, antimicrobial and antifungal properties. - It is also used in skin care and cosmetics.